Thanks to its appearance in the 1994 “Forest Gump” film, this lighthouse is a popular tourist spot. But if you arrive very early in the morning, you will share it with only the most dedicated landscape photographers. 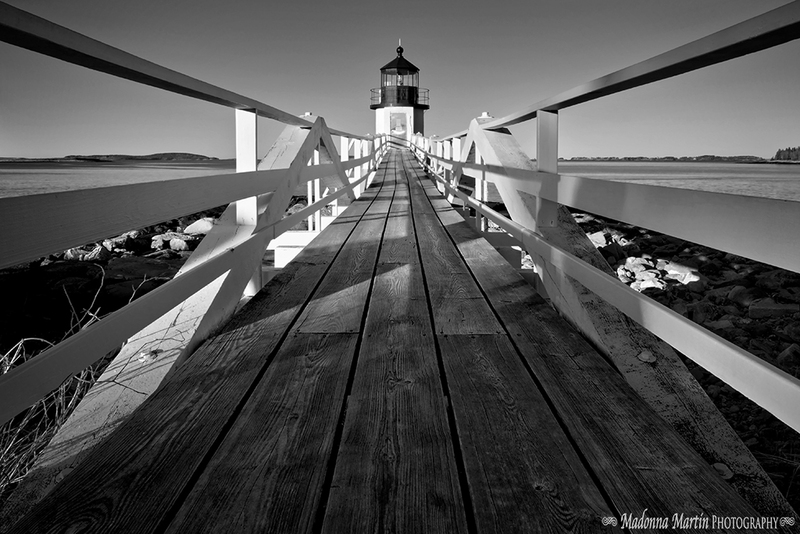 Here is a down-low shot that emphasizes the leading lines of the wooden walkway. A black and white treatment adds to the simplicity of the scene. You do such interesting things! I do love that little lighthouse at Port Clyde. So clear and crisp in black and white. I love black and white photos. .they seem so much more dramatic! Love this shot and especially in black and white! What a super cool view of the lighthouse!! I love how you have "pointed" to it with the walkway!! Great photo, how on earth did you get down so low. I try, but then I need a fork lift to get me up again, and I have the injured knees to prove it.